When you own an AGCO Certified Pre-Owned machine, you can rest assured it’s been through a rigorous inspection and reconditioning process. And we don’t just expect you to believe that, we back it up with industry-leading extended coverage that helps protect both your investment and your peace of mind. Search inventory. INSPECTED Before it can be part of the program, every pre-owned machine is rigorously inspected from top to bottom, inside and out. RECONDITIONED After inspection, each machine is thoroughly reconditioned. Components are repaired or replaced, some even upgraded with newer technology. CERTIFIED Every step of the inspection and reconditioning processes must be performed by an AGCO-certified technician. PROTECTED We back every machine with an AGCO Protection extended coverage plan so you can hit the field knowing your new investment is covered. Ready for duty. Any duty. Every Massey Ferguson, Challenger and Fendt pre-owned tractor in our program is fit and primed for any job you can throw at it. From grueling field duties to row crop operations to loader work. Rest assured, these always-reliable and innovative high-horsepower tractors can’t wait to get back to work. 120+ Point Inspection And Reconditioning. Enjoy the peace of mind that comes with knowing that our certified technicians have thoroughly inspected your tractor from top to bottom, at more than 120 different inspection points. And each has been thoroughly reconditioned so they’re as close to good-as-new as you can get. Machines under these year and hour thresholds are eligible to be part of the program. Every Certified Pre-Owned AGCO tractor is backed by a comprehensive 1-year protection plan. A deductible of $250 will be applied per incident. More Capacity. Less Complexity. Greater Productivity. Combines from Challenger, Massey Ferguson and Gleaner include some of the most impressive grain-handling machinery on the planet. Which gives you the flexibility to choose the machine that best suits your crop and terrain. They deliver like our new machines - for more capacity, reduced maintenance, improved fuel efficiency and cleaner grain. And they’ll keep delivering for many harvests to come. 200+ Point Inspection And Reconditioning. Our combines are already built for the long haul. And after each pre-owned combine runs the gauntlet of our extensive inspection, certification and reconditioning process, you can be confident you’re making a smart investment. Every Certified Pre-Owned AGCO combine is backed by a comprehensive 1-year protection plan. A deductible of $250 will be applied per incident. Giving some of the world’s best SP windrowers a second wind. Quality hay starts with bringing the industry’s most sophisticated technology down to earth, making ours the easiest, most efficient windrowers to operate, whether you’re an experienced hand or a first-timer. We invented the category, and for nearly 70 years, we’ve been dedicated to creating innovative products that produce one thing: Quality Hay. Just what you can expect from a Certified Pre-Owned model of your own. 110+ Point Inspection And Reconditioning. Our self-propelled windrowers are among the most premium haymaking equipment in the world. And after each pre-owned windrower goes through our relentless inspection, certification and reconditioning process, you can be confident your machine is ready to work as hard as ever. Every Certified Pre-Owned AGCO windrower is backed by a comprehensive 1-year protection plan. A deductible of $250 will be applied per incident. The building blocks for better hay harvests. Since we introduced the first large square baler in 1978, nobody has devoted more time and research into keeping products up to speed with ever-demanding harvests. 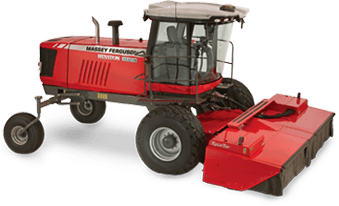 Our Challenger and Massey Ferguson balers maximize capacity to consistently produce dense, square-shouldered bales, no matter how fast you work or the challenges of your windrows. 140+ Point Inspection And Reconditioning. All our high-performance balers are built in Hesston, KS, a place with some serious hay heritage. That’s why we’re equally serious about the thorough 140+ point inspection, certification and reconditioning process each pre-owned baler undergoes. So you’ll know your baler is as close to good-as-new as it gets. Every Certified Pre-Owned AGCO baler is backed by a comprehensive 1-year protection plan. A deductible of $250 will be applied per incident. Professional-grade sprayers. From the people who invented them. The first RoGator® sprayer was conceived in 1969, creating a whole new category. It starts with amazing power to the ground, consistent traction, comfort-enhanced cabs - specifically built for applicators - and numerous liquid or dry application systems. And it results in the most consistently accurate application, so you can always count on better fields, better yields. 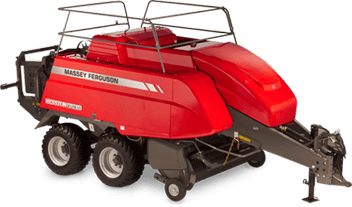 With a legacy like ours, we’re not going to sell a Certified Pre-Owned sprayer that doesn’t stack up to our exacting standards. That’s why every RoGator goes through a thorough 140-point inspection from the ground up, from the cab to the booms. We’ll also apply that same meticulous checking and diagnosis to the machine’s liquid, dry or Airmax® 180 system. So you’ll know that even though your sprayer has already been around the field a few times, it’s still a RoGator. Every Certified Pre-Owned AGCO sprayer is backed by a comprehensive 1-year protection plan. A deductible of $250 will be applied per incident. Each machine comes with an extended coverage plan so you can get to work with peace-of-mind. Every Certified Pre-Owned AGCO tractor, combine, windrower, large square baler and sprayer is backed by a comprehensive 1-year protection plan. A deductible of $250 will be applied per incident. See dealer for details on coverage. Tractors: AGCO Protection is for a minimum of 12 months or 500 hours from (i) the date of purchase (if out of base warranty on date of purchase) or (ii) the date the base warranty ends (if under base warranty on date of purchase), whichever occurs first. Deductible of $250 will be applied per incident. Coverage is limited to hydraulic, mechanical, electrical, structural and powertrain components. Restrictions apply. Please see a participating dealer for restriction and a full listing of the components covered by AGCO Protection. Combines: AGCO Protection is for a minimum of 12 months or 500 hours from (i) the date of purchase (if out of base warranty on date of purchase) or (ii) the date the base warranty ends (if under base warranty on date of purchase), whichever occurs first. Deductible of $250 will be applied per incident. Coverage is limited to powertrain, hydraulic, electrical, structural, feeder, lateral tilt, processor, chopper/spreader, separator, grain bin and elevator components. Restrictions apply. Please see a participating dealer for restrictions and a full listing of the components covered by AGCO Protection. Windrowers: AGCO Protection is for a minimum of 12 months or 500 hours from (i) the date of purchase (if out of base warranty on date of purchase) or (ii) the date the base warranty ends (if under base warranty on date of purchase), whichever occurs first. Deductible of $250 will be applied per incident. Coverage is limited to engine, transmission, driveline, hydrostatic, hydraulic, electrical/electronic, factory-installed air conditioner and structural components. Restrictions apply. Please see a participating dealer for restrictions and a full listing of the components covered by AGCO Protection. Large Square Balers: AGCO Protection is for a minimum of 12 months from (i) the date of purchase (if out of base warranty on date of purchase) or (ii) the date the base warranty ends (if under base warranty on date of purchase). Deductible of $250 will be applied per incident. Coverage is limited to all components of the baler as shipped from the manufacturer, except the chains, springs, belts, windguards, pickup tines, wheels and wheel hubs, wiring harnesses, light assemblies, flywheel brake assembly, parking brake assembly, replaceable filters, toolbox, paint and decals. Please see a participating dealer for a full listing of the components covered by AGCO Protection and restrictions. 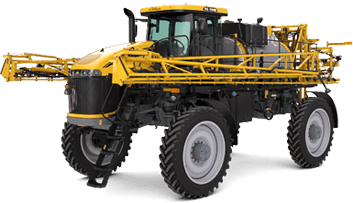 Sprayers: AGCO Protection is for a minimum of 12 months or a predetermined number of hours from the date of purchase if out of base warranty on date of purchase or from the date the base warranty ends if under base warranty on date of purchase, whichever occurs first. Deductible of $250 will be applied per incident. Coverage is limited to powertrain, hydraulics, electrical/electronic and general chassis components. Restrictions apply. Please see a participating dealer for restrictions and a full listing of the components covered by AGCO Protection.